Thyme and sage, along with celery and carrot, remind me of the makings of a good Thanksgiving stuffing. Be sure to press out as much liquid from the tofu as possible, which helps it absorb the flavors of the other ingredients. This recipe easily can be doubled and tripled. Cut the tofu cross-wise three times to make three slabs. Wrap in paper towels and put on a cutting board. Put a heavy object (such as a plate with a few canned goods on top) on top of it to press out excess liquid. Let sit about 1/2 hour, changing paper towels when they are soaked through. 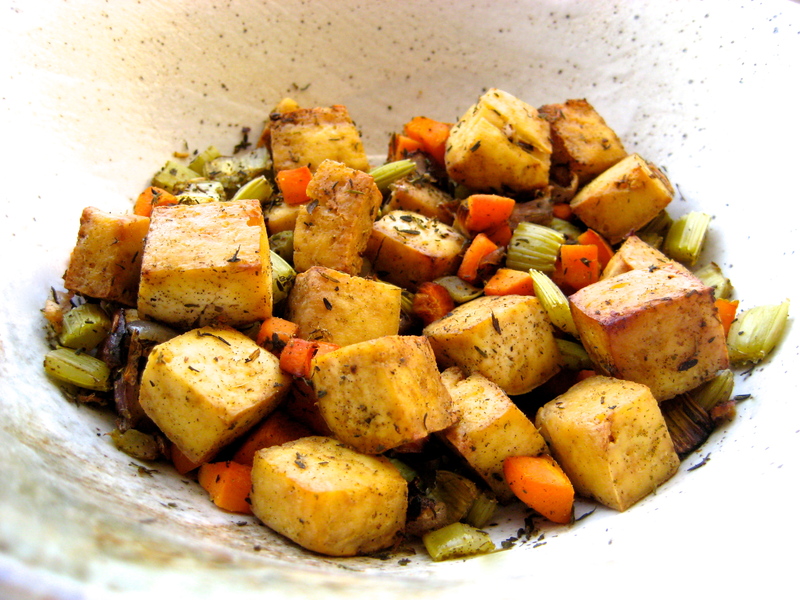 Preheat the oven to 425 F. After the tofu is pressed, cut each slab into nine cubes. Put in a small glass baking dish with celery, carrots, shallots, and garlic. Add the broth, olive oil, cider vinegar, thyme, sage, and salt and pepper. Mix well. Cover with aluminum foil and bake for 30 minutes. Remove the foil, stir the mixture, and bake for an additional 30 to 45 minutes until browned and crispy. I’ve never had Tofurkey or Field Roast or Seitan or any of those, but I do like the tofu! I haven’t reheat it before, but I can’t see why not. The only thing I would consider is maybe saving some broth, and then when you reheat it, just add a bit enough to saturate the ingredients before re-baking. That all said, I think it would be fine!